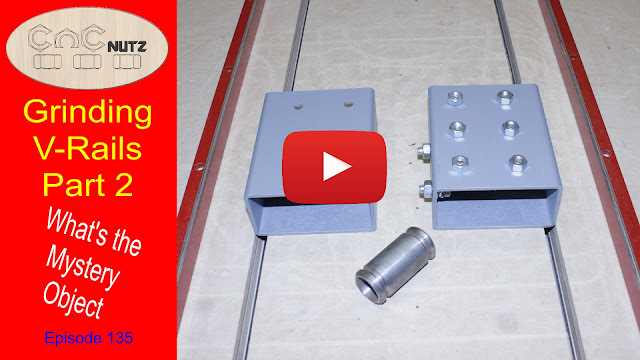 Continuing on with the rail upgrade for my machine I show how I complete the rails by putting the mounting holes in them and then after painting the rails I need to remove any paint that had accumulated on the V part of the rail. Leaving this on the rail will cause it to come off as the V-Bearing rolls over it and it will accumulate on the V-Bearing. This is a problem to remove from the bearing and can be avoied by simply cleaning the rail before installing it. Another part that needs to be made it a mount to attach the X rail to the new Y carriage. This is done with the aid of some box section steel and by using a simple jig, drilling holes in both the V-Rail and the X rail mounting block can be done very easily and accurately with minimal measuring. In a future episode I will install the new Y carriages and attach the existing X rail. I anticipate a few issues while doing this install with the most obvious being how and where to mount the SuperPID speed control currently mounted to one of the Y carriages. I may also need to add additional bracing to the X rail to attach it to the Y carriage. These are issues that will be addressed as the install proceeds. At this time I have no scheduled time for the upgrade. It will depend on available tiime but it should be soon.